about 25 years old, of a dark complexion, about 5 feet 5 or 6 inches high, and tolerably well built. He is a tolerable good rough Carpenter —a good cook, and can do almost any kind of farming work. No particular body marks or scars recollected. He took with him a fur Hat, a drab cloth Roundabout, one pair of brown and one of blue cloth Pantaloons. No other clothing particularlary recollected. 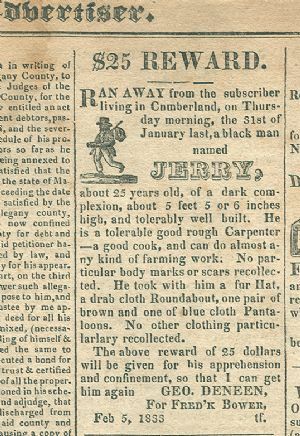 This runaway slave notice for "Jerry" appeared in The Advocate, Cumberland, Maryland, Tuesday, March 12, 1833. The slave notices appeared in the back of The Advocate in a section called "The Allegany Advertiser" which featured all types of ads for things to buy and sell. Maryland emancipated its slaves on November 1, 1864. On September 17, 1870, the census of Cumberland was released. Of this, the total population was 10,640. Cumberland's black population was 690, while 1,166 free blacks lived in the entire Allegany County. Prior to the Civil War, Maryland had a law which stated that if a freed black came into slave territory from elsewhere he could be fined $20. A second offense warranted a fine of $500. If the fine could not be paid, the person could be auctioned off as a slave to raise the money. The Maryland Advocate, printed in Cumberland in the late 1820's and 1830's often listed runaway slave notices. The Alleganian newspaper, well into the late 1840's, also printed notices of rewards for runaway slaves, editorials blasting abolitionists, and advertisements for public sales of "Land and Negroes".